Home > Blog > Looking for a Shaw SmartVoice Review? Looking for a Shaw SmartVoice Review? You may have heard about Shaw SmartVoice recently? 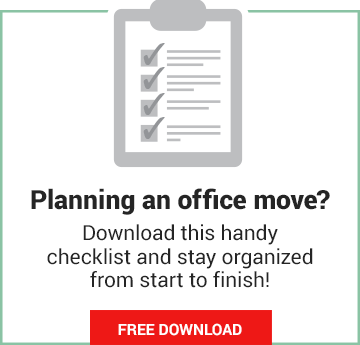 You might even be considering it for your business right now. Or, maybe you’re interested in knowing more about it before you make a decision on the future of your company’s communications. We’ve had a lot of questions from people asking about SmartVoice, looking for more information. You might wonder why they ask us? As brokers (of sorts) for telecommunications, we work with multiple brands and providers (Mitel, SmartVoice, PhoneSuite, Zultys, Toshiba, etc. ), Which enables us to get to know the best options available across the telecommunication industry. . It also gives us the unique ability to gain an in-depth knowledge of the pros and cons as well as best applications of the different solutions available and share a well rounded picture from our experience. That term “solution” gets used so often that it sometimes feels like it’s lost all its poignancy, but it really is the word that should be on your mind during the buying process. A telephone system can be a solution not only to the problems at hand, but also one that can open up new possibilities for work place efficiency, and greater communication. Speaking with experts and clarifying what the right solution is for you is step number one. Once you know exactly what you’re trying to solve, what will help improve your business, then it’s much easier to find the solution you need. By the way, I’m going to break the rules here and just come out and say – If you are looking for a new phone system and don’t have someone who you can consult with, give us a call, please! You can reach out to us from anywhere in the country via our toll free number and we’d be happy to help you in your buying journey. It’s tough to know everything about an industry just for one purchase, so if you need help in your shopping, we can help you. With that said, here is our review of the pros and the…“not-everyone’s-cup-of-tea” aspects of Shaw SmartVoice. Hopefully this will be able to help you decide on whether SmartVoice is the phone system for your business. What initially attracted you to SmartVoice? Was it the ease of setup, or the platform’s back-end security? Or was it the enterprise like features, or the fact that it has a very low upfront cost? From only needing a few phones (and not wanting to invest in a full phone system) to the attractiveness of simple solutions, there are many reasons why businesses choose a solution like SmartVoice. We put together a list of 6 things we like about Shaw SmartVoice and 3 things that should be considered to see if it’s the right fit for your organization. 1. 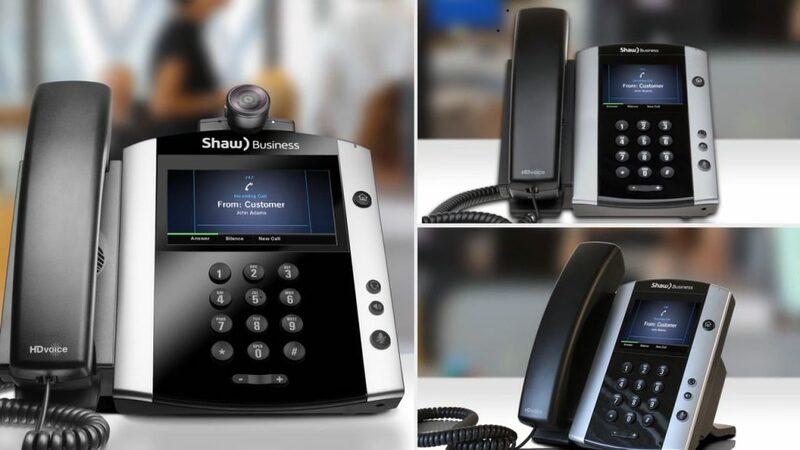 It’s quick, easy, and simple – since Shaw handles the back end, or the “brains” of the telephony solution and the installation, you don’t have to worry too much about the details. You can simply pick the platform you want; based on the features you want. The great part about the simplicity offered is you can easily match the solution you want to the issue you feel needs to be solved. For example, if you do a lot of traveling you can add the mobility option to your system; which allows you to make (or receive) important business calls through your office number, on your cell phone, anywhere in the world. You don’t even have to have network connection as long as you have Wi-Fi (even hotel Wi-Fi) you can send and receive calls as if you were in your office. 2. It’s secure – Shaw’s security back-end is quite impressive; they cover everything from network security to user security for your entire system. The SmartVoice system is isolated from the public internet which means connections have to go through the Shaw network security before they can reach the SmartVoice core. From the public internet, the connection goes through a firewall to connect to the Shaw network and then through a second firewall to reach the SmartVoice servers. On top of that, your voice data is encrypted between your system and the Shaw core network leaving it very well protected. 3. It’s affordable (especially for small startups and businesses with only a few users) – like many hosted platforms, the implementation of SmartVoice is quite nice for small businesses because there are no large upfront equipment costs aside from a $50 per seat install fee. Unlike many other hosted providers, Shaw recently changed the requirements so that SmartVoice has no minimum purchase, meaning you can get SmartVoice even if you only need one phone (most hosted providers require a minimum of five phones). This is great for freelancers, start-up’s, and small businesses, who only need a few phones (or even just one), to have the ability to communicate like a much bigger organization – features like call flows, automated attendants, and even on-the-fly conferencing will help you easily work with the same efficiency as much larger organizations. The prices range from $26.95 per month to $59.95 per month, per seat, depending on the features you need and the time-frame you want. 4. Features – SmartVoice has all the trimmings (but at a cost) – From mobility (ability to work anywhere, office, home, hotel, etc.) and instant messaging, to screen sharing and audio/video conferencing, from auto attendant and presence notification, to the software client, you can get many of the features that (until recently) were reserved for enterprise grade phone systems with SmartVoice. The one thing to keep in mind with SmartVoice is that, like all hosted systems, your payments are going to continue in perpetuity, which means that if you go with all the “bells & whistles” (and the added costs they bring) you will pay that fee for as long as you have your phones. This is great if you only need a few phones to start with; or if you’re looking at the short term (getting something set up right away and waiting till you’re more established to buy a more tailor made system), or if you really just love the fact that you don’t have to do any upkeep upgrades or worry about other hassles that would divert you from your business (and you would rather pay a monthly fee for your communications and peace of mind). 5. Disaster recovery (though it can be a double edged sword) – Because the actual “brains” of the phone system are not on your premises if any sort of disaster were to take place at your premises your phone system would be perfectly safe… not the phones on your desks necessarily, but your data, and back end systems would be unaffected. In fact, in a case like this, you would be able to continue communications as usual through your mobile phones (if on the mobile platform) or through a designated mobile phone set up as your backup phone, so customers can still reach you even during an emergency. In other words, you’d be able to continue all communications until you get new desk phones, because your back end systems are safe. If something happens at your phone providers data centre you are completely left at their mercy until they are able to get it back up and running again. The silver lining is, on the rare chance that the back end “brains” of the system are affected, you won’t be the only company that’s lost communications and you won’t be the only ones calling in to see what’s going on. You can bet that your provider will be doing everything they possibly can to get you all back up and running when hundreds of angry customers start calling in. This point could have been on the”pros” list because its another “double-edged-sword” type of feature. For some organizations this is going to be exactly what you want – more control of your system. For others this will be one of the reasons why you were looking into a hosted phone system to begin with – to relinquish the need to manage or administrate your telephone system. Shaw supplies all users with an on-line administration portal and login, after training is provided by your installation technician, you will be handed full control of the administration of your phone system. Full control of administering your phone system (via the SmartVoice web portal) is great if you are somewhat knowledgeable in managing an IP phone system (or if managing it yourself is something that is important to you); however, if you’re not familiar with it, you may find yourself in over your head with administration and upkeep. It’s entirely possible to retain the knowledge and effectively administer and maintain your phone system. However, if you feel like having to manage your own phone system defeats the purpose of paying to have someone else taking care of it – even if it’s not too difficult to do – there are other options that are available and come with full support. For example, we always offer a support and service solution with the phones we install (we even offer it on our SmartVoice installs) and we’ve found many of our customers prefer leaving everything in our hands to manage, and just letting us know when they want changes done. But this is something that really depends on your preferences and how the care, administration and features of the phone system solution compares to others you are considering. 2. Payments are ongoing (your payments continue for as long as you use the service). Unlike a leased phone solution where, after five years, you own your hardware; with Shaw SmartVoice (as with pretty much all other hosted platforms) you will continue to pay in perpetuity as long as you are using the service. This is not a problem if you have a smaller workforce (usually under 10 users) or a limited number of phones, or if that’s your preferred way of operating (as with leasing a car), but it can become taxing as your workforce grows. For example, if you have 10 phones at $39.99 per month, your monthly cost is $399.99 per month. But if your company were to expand to 20 users, all of a sudden your monthly costs are doubled to 799.80 per month – in perpetuity – which over the course of time will come out as a much more costly option when compared to buying your own phone system. Each additional feature also adds additional recurring costs (e.g. adding a conference bridge is $5 per participant in perpetuity). This is where a premise based system could be a better option (depending on the variables and needs of your particular business). With the premise based system, even if you were paying the exact same monthly costs, they would only continue until the end of the term (let’s say the same 5 years) at which point that system is yours and you no longer pay anything for it except for the phone lines its attached to (and a support plan if that’s what you choose). This may be the optimal model for you, but it is worth having a discussion with your telecom consultants about which model is better in the long run for your business, whether that is a hosted, premise based, or even a hybrid phone system. (You can read more about the pros and cons of hosted vs. premise telephone systems here). While the SmartVoice solution has quite a range of powerful enterprise features, it’s not customizable in the way that some other solutions are. As a company that deals extensively with custom solutions for niche markets, we know there are many businesses that require specific customizations to be their most effective. Sometimes it’s as simple as programming a certain key for one-touch dialing, call parking, or paging. Other times it’s as complex as layering on entire software sets tailored specifically to an industry (e.g. 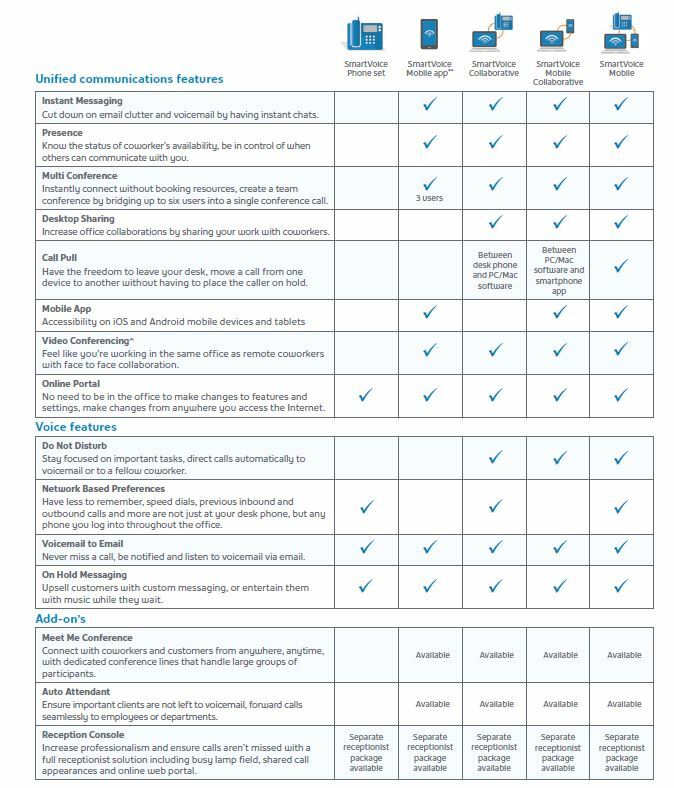 Dental software integrations and appointment reminders or automatic check-in for hotels, along with integration of guest’s mobile phones, to be used as room keys). In other words, if your organization requires specific software integrations and customizations, or applications for call/contact centers, or API’s for unique proprietary software, automation, or even just the flexibility of being able to mold your phone system uniquely to your business, then we would recommend another option. There are definitely cases where SmartVoice is the perfect solution. There are also times when it is not. When you are buying a phone system, one thing to keep in mind is that you are not just buying technology; you’re buying a business solution. Be sure to ask how this phone system improves your business, how it meets your basic requirements, but also how it will help in keeping your business competitive in the future. Our suggestion is that you should reach out to your telecommunications advisors (or consultants) and make sure you’re aware of what’s available, then you can make a well informed decision on whether or not a solution is right for you. A telecom advisor or consultant is like a personal trainer. When trying to seriously improve your fitness or health very few people who are experts in their own fields and successful in their own businesses have the time to start investing in the trial-and-error it takes to learn all they need to know to stay fit; it’s a complex world, with complex exercises and diets. That’s why so many people prefer to hire an expert; this can be a personal trainer or following someone you trust on their website or on YouTube (my personal favorites are linked here and here). You find someone who you know will help you reach the results you need, who you know has spent their career investing the time and energy it takes to become an expert – someone who you can trust! So don’t be afraid to engage experts on this, to ask the questions and get the answers you need to find your perfect phone system (and don’t be afraid to ask the questions that need to be asked, the difficult questions). What we’ve covered today in SmartVoice might be exactly what you want… or maybe it’s not exactly what you’d hoped it was, but if nothing else, hopefully you have a better idea of what SmartVoice offers, where it excels, and where it has its drawbacks (like everything does, no matter how often marketers and sales people try to hide the flaw’s). Good luck in your search; and if you have any questions, don’t hesitate to ask (you can reach out to us of Facebook, on Twitter, or on LinkedIn to ask any questions you might have).